When it’s cold outside, snuggle up with Slumber. The wonderful new way to make temperatures rise and heating bills fall ! 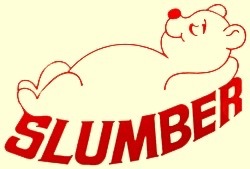 Slumber incorporates imported heating elements in a modern, safe and efficient design-and conforms to British standards for electrical blankets. Slumber’s concealed insulated heaters are totally flexible and water resistant. And it has nine thermal cut-outs to prevent overheating due to misuse or accident. Even your kids can use Slumber… it’s so simple to operate. A separate module is attached to the blanket by a four-metre long cord, for convenience, in case the a.c. outlet is far away. Just switch on Slumber about 20 minutes before bedtime. And a warm, blissful bed will welcome you. Later, use Slumber as an overblanket through the night, setting a constant temperature whether the room gets warmer or colder. Slumber operates at one-tenth the electricity cost of a room heater. This means a saving of atleast Rs.200 every month on bedroom heating. Its double bed size-84″ x 72″ and its fine brushed terecotton comfort makes it great for sharing. Light and easy to handle, it offers warmth without weight. and appropriate radio requency suppression. 4 mtrs. from regulator to plug. Guarantee 1 year against manufacturing defects. Disconnect the module from the blanket and then dryclean. In case blanket gets wet, use only when completely dry.